The excitement of getting to dine at Bruno Loubet’s latest London reincarnation – Bistrot Bruno Loubet at The Zetter Hotel – was surpassed, for me anyway, by the fact that we got to sit next to Sir Michael Caine during dinner. To be precise, he was actually sitting at the table next to us with his beautiful wife Shakira (you would never believe she’s 63), but he was so close to me I could have easily tapped him on his shoulder. He sounds just like he does on the big screen, all nasally in that charming, endearing kind of way. I pretended to be all cool, like I hadn’t noticed him, but I must admit to secretly gaping at him out of the corner of my eye. Well it was no surprise that he would get fawned over – he is a huge celebrity after all. But what was surprising was just how useless our assigned waiter was. He took his time to come and take our order. And when he did come, he didn’t have a pen, so he walked off to get one, and then for some reason forgot to come back. What kind of waiter doesn’t have a pen? He also took his time delivering our bread. But that said, some of the other waiters who also served us during the evening were lovely and attentive, so I don’t think it would be fair to say that all of the service was bad. Bruno Loubet earnt a notable reputation as a chef under the likes of Pierre Koffman and Raymond Blanc in the 1990s, before going on to successfully head up restaurants Bistro Bruno and L’Odeon. He spent much of the Noughties in Australia, but a decade later, and he’s back in London. With his background, it’s unsurprising that Bistrot Bruno Loubet is classically French. Guinea fowl boudin blanc (£7) was exquisitely light with a mousse-like texture, but it was a touch heavy on the seasoning. The accompanying creamy leek fondue and chervil sauce married beautifully with the gentle guinea fowl flavour. Having once watched a boudin blanc demonstration at Le Cordon Bleu, this is a fairly complex dish to make. This was a wonderful rendition of the Lyonnaise classic. 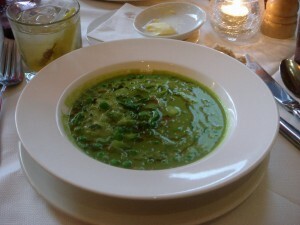 Pea soup à la Française (£6.50) was an absolute stunner. Whole, fresh, summery peas had been perfectly cooked, leaving them with a little crunch. They blended beautifully with a pureed soup rich with pea flavour. 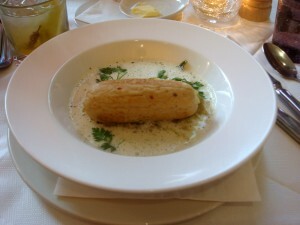 Crisp and creamy, this was one of the best dishes I have tasted all year, and very modestly priced at £6.50. JK went for two more starters rather than a main. 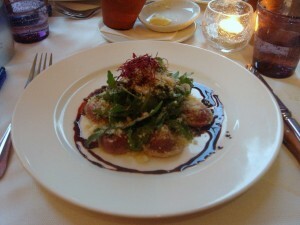 One was a beetroot ravioli with fried breadcrumbs and sage, and rocket salad (£6.50). The beetroot ravioli were fine, but lacked the lightness and finesse of truly good Italian pasta. The salad was also light on balsamic dressing, and the addition of the breadcrumbs which gave the dish some crunch, also had the effect of making the salad quite dry. Overall, this was a passable starter, but much more dressing was called for. 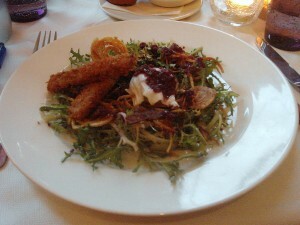 A revised Lyonnaise salad and Beaujolais dressing (£7) included deep fried crumbed pig’s trotters, bacon, and a poached egg. Lacking a gelatinous texture, the pig’s trotters were quite dry and tasted more like ham hock. They worked better when eaten with the runny yolk from the poached egg for the latter provided some added moisture. Again more dressing would have helped to elevate this dish. The frisée leaves also made the dish look messy. A quail dodine (boned) stuffed with veal, pork and pistachio (£16.50) was perfectly cooked to produce a wonderfully tender quail heady with the moist flavours of veal and pork. 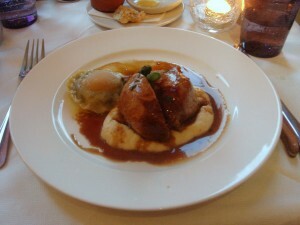 It was served with a spinach and egg yolk raviolo, parsnip purée and a veal and Madeira jus. The ravioli again lacked the finesse of good Italian pasta. But the purée was creamy and rich, and the jus, which had been intensely reduced, helped to finish off an otherwise excellently executed dish. 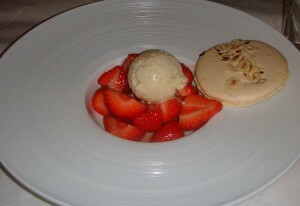 Dessert of strawberries marinated in Grand Marnier (£8.50) served with a green peppercorn ice cream and hazelnut meringue was a disappointment. There was a nice orange flavour coming through from the alcohol, but the strawberries were quite acidic, and the peppercorn ice cream tasted like dust and left an unpleasant aftertaste. The meringue was quite tasty, but it erred on the side of being sugary rather than light and fluffy. I thoroughly enjoyed our meal at Bistrot Bruno Loubet. There were some minor hiccups, but the good far outweighed the bad. The salads and the dessert didn’t quite hit the high notes, but there was enough coming through from the other dishes to demonstrate technical dexterity and skill. The pea soup was outstanding, and the boudin blanc and quail dishes, with their complex preparation requirements were executed beautifully. And the pricing is incredibly reasonable for the overall high quality of cooking. Starters hover at around £7 and mains at around £16. I also adored the dining room with its relaxed, buzzy atmosphere. The high windows that encase the restaurant lets in lots of natural light, and with the long evenings, it creates an indoor ‘al fresco’ feel. That said, you have to eat quickly as the wooden bistro chairs with no padding make for uncomfortable sitting for long periods of time. This is a worthy addition to the London dining scene, and it has definitely made it on my list as a place to go. Price range: Three courses ranges from £24 to £33. Excludes drinks and service. I was at Bruno Loubet a few weeks ago and also ordered two starters for a meal – in my case, the Lyonnais salad was perfect. In my experience, it’s always comprised of frisee, but your comment about the frisee looking “messy” suggests you’d rather something else be used in its place? I’m planning to go back in a few days’ time (this time with my camera) so I can blog about it, but it’s funny you happened to post this review just after I made my booking there! Our timing is spot on. I suppose Bruno Loubet is one of those places that is drawing a lot of attention right now. I look forward to reading your write-up. Yes I concede the frisee leaves are the right choice of leaves. But they are so curly, and there was just so much of it that I couldn’t help but think it made the plate look messy. Anyway, have a great meal.